On Saturday, members of the State Hermitage Museum, once again will celebrate the Day of the March Cat. This tradition started in 1998. On this day the museum will be awarding the winners of children's drawings Hermitage tale about cats. " Children are also offered to paint a veneer of cats, established in the Grand Courtyard of the Winter Palace by the artist from the art group "Mitka" Dmitry Shagin, says AIF . Day of March Cat-2011 until this year was included in the official calendar of holidays and anniversaries, as well as exhibitions of the museum. As reported by news agency REGNUM , at a press conference in St. Petersburg said the deputy director of the Hermitage, Svetlana Adaksina. Adaksina recalled that the first male appeared at the palace of Peter I in his Winter Palace - the cat was brought from Holland. Cats in the Hermitage, which we know now, have lived here since the days of Elizabeth, loved cats and Catherine the Great - she had a Russian blue room and yard cats. The tradition of living cats in the deep and vast Hermitage cellars interrupted only for the period of the blockade, but after WWII cats reappeared. Holiday cover and the traditional "cat," the museum grounds. 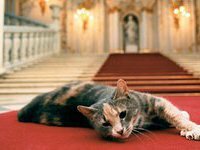 In the attic of the Winter Palace, St. Petersburg will open dedicated to cats exhibition, which will feature over 40 works written especially for the festival, and museum staff will conduct tours to the cellars of the Winter, where visitors can see how they live the famous Hermitage cats, adds RIA Novosti news agency .